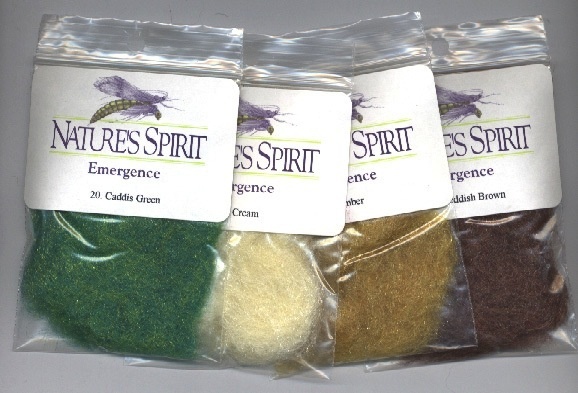 Nature's Spirit has had numerous requests to add a product that would be an appropriate simulation for the ever growing awareness of the success of emerger type flies. 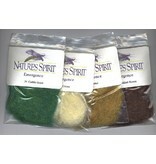 Nature's Spirit emergence dubbing will answer your needs. It is known that aquatic insects in this stage have an aura about them not unlike a glow. These insects emit gases that help propel them to the vulnerable surface film before their transition to the adult stage. This product possesses ingredients that will give your flies that life-like appearance you need to duplicate the two above criteria of this important stage in a mayfly, caddis and midge life cycle. There are nine colors intended to match the spectrum of the majority of emerging nymphs that inhabit our rivers and lakes.